Golfers around the world are getting their first glimpse of the new rulebook which will govern the game from the start of next year. A raft of changes aimed at making golf quicker and more enjoyable will be introduced from 1 January, 2019. The R&A and the United States Golf Association, the joint rules-making bodies, have also taken steps to make them easier to understand. For the first time a ‘player’s edition’ of the Rules of Golf has been launched and it includes diagrams and illustrations as well as more direct language to explain the complexities of the game. “This is a pretty exciting day for us, it has been six and-a-half years in the making,” David Rickman, the R&A’s director of governance told BBC Sport. Changes that come in next year were first launched for public consultation in March 2017. The authorities received more than 30,000 pieces of feedback before refining the proposals which were published on 12 March this year. “The general tenor of these changes has been the removal of penalties, the removal of restrictions, creating a slightly more relaxed approach,” Rickman said. Players will also be able to access the new rulebook online and through a smartphone app. 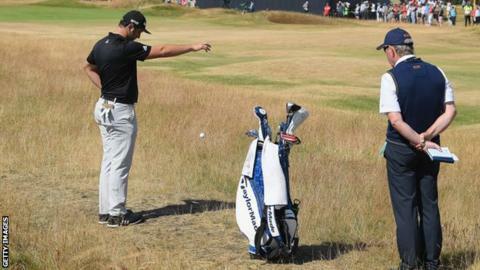 The R&A admit that previous rulebooks were difficult to understand. “The rules were cleverly written but they were quite sophisticated and you had to know your way round them so we did spend a lot of time looking at layout and structure,” Rickman added. “This is all now very real and now the new rules are out there. The new players’ edition, something we have not done before, concentrates on the most commonly occurring rules and allows us to focus on those. “We can present them in different ways, more direct language, a lot of diagrams and illustrations which are particularly useful around relief options. “It is also worth noting modified rules for players with disabilities. We’ve had these modifications in place for the best part of 20 years but we haven’t promoted them as much as we perhaps should. The launch of the new rulebook comes on the same day as the R&A revealed what it calls a “playbook” outlining the governing body’s “vision, purpose and values”. They aim to make golf more accessible, appealing and inclusive while upholding the sport’s traditions and breaking down barriers to progress. Investment totalling £200m is being promised to develop golf over the next decade. “Our new brand brings together everything we have done over the last three years on ways to modernise golf and take the sport forward,” said R&A chief executive Martin Slumbers. ← Previous Story Quiz: Can you name all of golf's world number ones?